I visited each of your newsletter articles (453) available on your website and looked how frequently you mentioned teams and players. 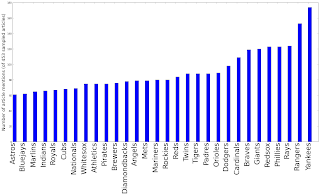 Each team/player only counted once per article, i.e., an article mentioning the Yankees twice only counted once. 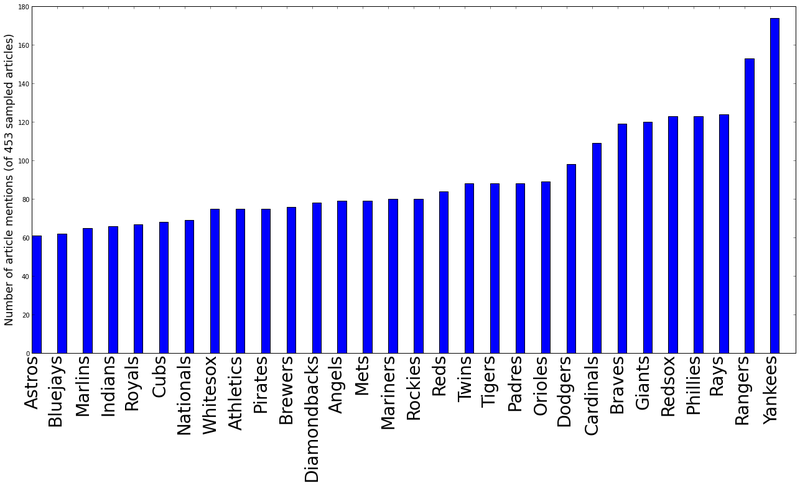 To the results: you wrote about the Yankees and Rangers a lot, nearly three times as frequently as the Astros, Blue Jays, Marlins, and a few other teams. Your most commonly mentioned player was Cliff Lee (makes sense; he's been a big trade deadline / free agent / superstar pitcher over the sample period). This analysis was done last fall, so it's slightly out of date. (That's on me, not Travis, as I've been sitting on this for a while.) But it's fun to share, and I hope you'll get a kick out of it. Thanks to Travis for doing the work.